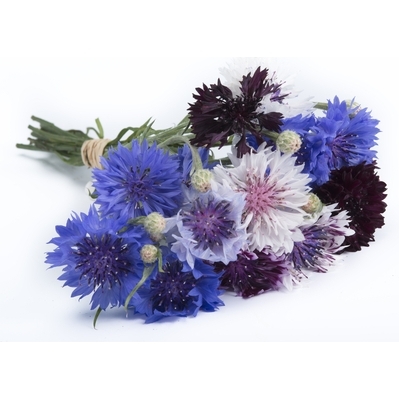 c o r n f l o w e r . . .
Cornflower, a hardy annual, is a traditional cottage garden flower with beautiful, edible, electric blue or mixed colour flowers which have a delicate clove-like flavour. It looks great in the border, growing to a height of 90cm, encourages beneficial insects and makes a wonderful cut flower. Petals are edible and add colour to salads, drinks and desserts. Sow: your cornflower seeds direct, where they are to flower, from late March to May, in shallow drills. 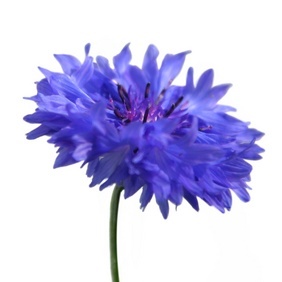 Choose a sunny spot but don't worry about soil quality; cornflowers are not fussy. 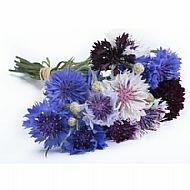 Alternatively, if you are organised, sow your cornflowers seeds in September, outdoors in milder parts of the UK or undercover in the cooler regions. You will be rewarded with stronger, taller plants which will flower weeks before those sown in Spring. Aftercare: Thin to 25cm apart when seedlings are large enough to handle. Autumn sown plants may require support.